The USS Belknap was the first ship in a new group of guided missile cruisers. She was laid down in 1962 and launched in 1963. She was reclassified as CG-26 in 1975 and in the same year, a major accident occurred when she collided with the aircraft carrier USS John F. Kennedy. The accident killed seven crew on the cruiser and one on the aircraft carrier and severely damaged the ship. She remained in service for another 20 plus years before being decommissioned. It was widely believed the accident resulted in the US Navy changing the way they built ships. On the night of November 22, 1975, the two ships were located about 70 miles off the coast of Sicily, Italy, where they were performing night-time flying exercises. The ships were running parallel to each other when the Belknap randomly made a turn into the carrier. 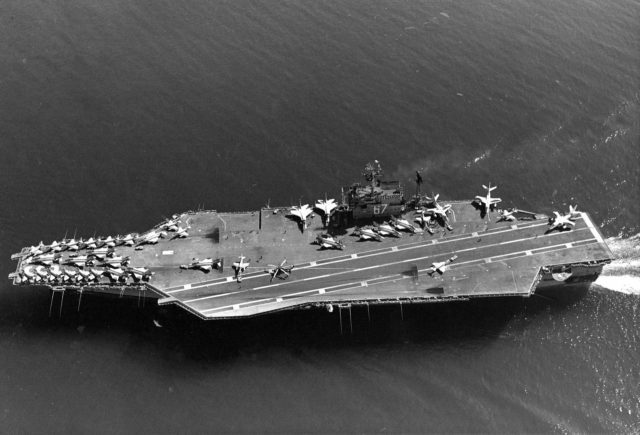 As the two ships collided, there were reports that the aircraft carrier’s flight deck caused the Belknap’s mast, as well as its stack, to fall onto the ship. 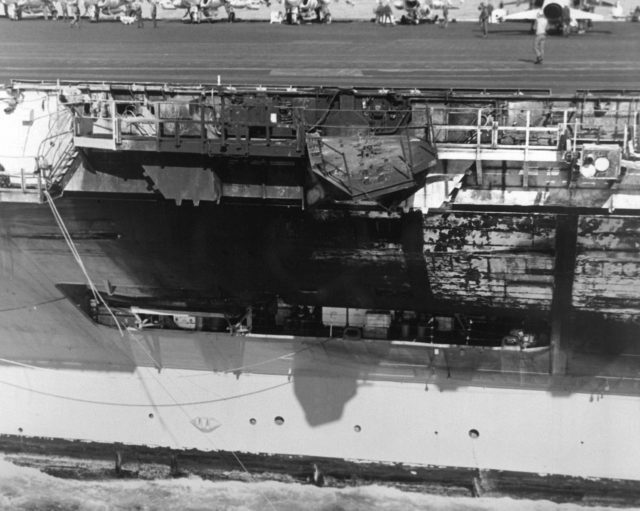 One of the fuel lines on the carrier just beneath the flight deck was severed during the collision and spilled gas over the Belknap. The resulting fires quickly took hold of the ship. The Belknap’s crew worked on containing the blaze. 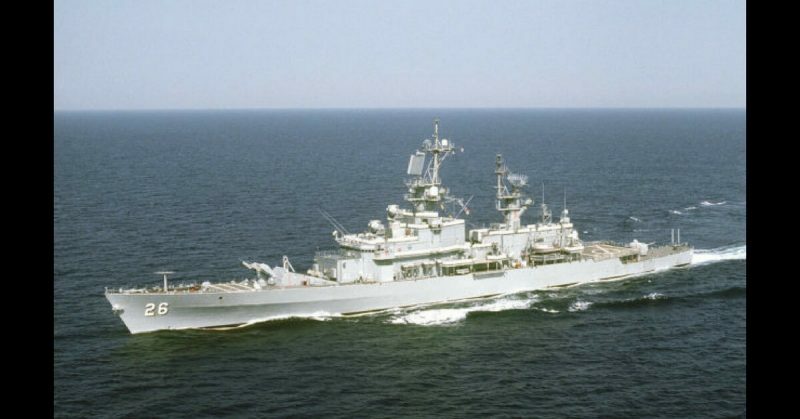 The guided missile destroyer the Claude V. Ricketts and the destroyer Bordelon went to assist. They aimed their fire hoses at parts of the Belknap her crew could no longer access. The Claude V. Ricketts moved in to get injured men off the ship. The fire was spreading rampantly, setting fire to everything, including ammunition. With shrapnel raining down from the explosions and the tremendous fire; it was a dramatic scene. As the rescue continued, some men did not want to leave their ship and stayed to fight the fire. It took more than two hours to get the fire under control. By the time it was, the damage was extensive. When the cruiser had been built, aluminum was used for the superstructure. Unfortunately, aluminum melts at extreme temperatures. Part of the ship had been destroyed leaving a gaping hole. 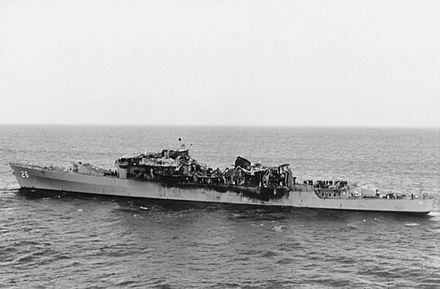 The USS John F. Kennedy incurred some damage mainly due to fire from the spilled fuel. The event earned the carrier the nicknames “Can Opener” and “Jack the Tin Can Killer”. It was believed that if the Belknap‘s superstructure had been built with steel, the damage would not have been as bad. Not long after this incident, the US Navy made the decision to switch to all-steel superstructures. While it was suggested the change was as a result of the Belknap-Kennedy collision, the New York Times wrote an article in 1987 stating the change was made due to cracking in several aluminum superstructures. Once the dust had cleared, the USS Belknap was taken to an ammunition depot where it was stripped of any remaining ammunition. The crew was shifted to the ammunition ship Mount Baker until they could be placed somewhere else or reassigned. The Belknap was sent to the Philadelphia Naval Yard, where she spent four years, from 1976-1980, being reconstructed. In 1985, she was converted to a flagship. One notable event for the ship came in 1989, when President George H.W. Bush stayed on board her during the Malta Summit. After its short and somewhat rich history, the Belknap was decommissioned in 1995, and sunk three years later.